Dorm Co. Tip: Dorm rugs are essential college decor items! When you found out your college dorm room assignment, you pictured the perfect dorm room in your mind. Everything looked complete and put together and it was incredibly comfortable. The problem is, you may have pictured soft dorm carpeting as part of that complete dorm room. Your college dorm room won't have the great looking, soft dorm rug you may have been picturing, so to have that dorm necessity, you need to add it yourself. However, adding it yourself means you get freedom with your design elements you wouldn't normally have with a dorm rug that was already added! 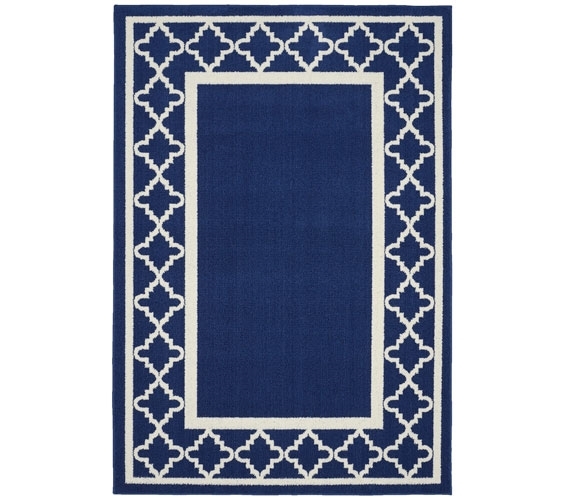 For a great looking dorm room decor, add our Moroccan Frame Dorm Rug in Indigo and Ivory. Our Moroccan Frame Dorm Rug in Indigo and Ivory features a bold pattern with neutrally colored highlights for a dorm room decoration that will create quite an impact. Our Moroccan Frame Dorm Rug in Indigo and Ivory features a simple ivory Moroccan print frame around the outer edges for a little bit of design that won't overpower your other color schemes and patterns. As a backdrop to this frame is bold solid indigo coloring that will add relaxing color tones to your dorm room decorations. You want your college dorm room to feel complete and be comforting. To complete your dorm room decorations, a dorm rug is a necessary and comfortable addition.